In Ground Pool or Above Ground Pool? In-ground or above-ground? You may be wondering whether to invest in an in-ground pool or choose one of the less expensive above-ground pools that are available. Pool Troopers can help you learn more about the difference between these two options and which one might be right for your home and budget. Gunite and Shotcrete are pneumatically applied concrete sprayed through a hose on-site to form the pool’s shell. The pool shell will then be coated with an interior plaster that might have color, rock or colored glass added to give the pool a particular look. Later, decorative tiles are used at the water line to enhance the pool’s look and functionality. Although it can take weeks to build, this type of pool offers the most choices in shape and design. An in-ground vinyl pool is prepackaged; the vinyl refers to the liner. It can be ready to use in just a week. Although there is less variety in the shape of the pool, liners can be printed with tile designs or patterns that appear to be real tiles. This type of pool is less expensive than the concrete variety. Areas with shifting ground conditions are not good candidates for these types of pools. Fiberglass pools come in a variety of shapes, although the choice is limited. They are sunk into the ground at the site. They take about a week to install; the cost is usually less than a concrete pool. Above-ground pools are another choice that tends to be the least expensive and quickest to set up. Arriving in a kit, a team of installation technicians erects the materials, typically in a few days. The above-ground pool comes in limited shapes, depth is usually 48 to 52 inches deep, so this type of pool is never safe for diving. The above-ground pool is considered more temporary as an addition to your backyard area. Although you may have invested some money in making it fit into the surrounding landscape, it does not add value to your home when it comes time to sell. In fact, you will be able to remove this type of pool when you move or if the buyer does not want it. On the other hand, the in-ground pool costs more initially to install and is permanent. However, it can add value to your home as well as provide an area for entertaining. The addition of such features as diving boards, water slides, steps, etc. make it more appealing to families. When it comes time to sell your home, this type of pool will add landscape- enhancing features, often providing relaxing views of the water from the interior of the house; such a bonus might further appeal to a buyer. 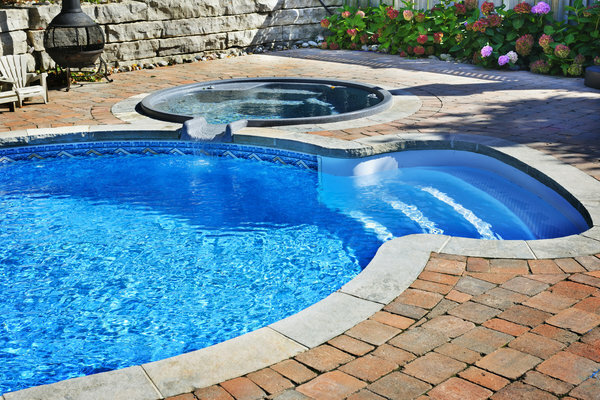 Since both types of pools require maintenance, your choice in the type of pool might be decided by its use, your budget, and your backyard area. However, you should be aware that the in-ground pool is a better investment in the long-run, especially when it comes time to sell your home. Pool Troopers can help with the servicing and maintenance of your family’s in-ground concrete pool. Our knowledgeable and friendly pool technicians are ready to assist, because your investment in the health and safety of your friends and family is just as important as the financial investment in your pool.